How to implement "Lean Thinking" in a Business: Strategy Deployment - What does it mean for a company? Strategy Deployment - What does it mean for a company? First off, I would like to apologize for my absence in July, I have been on the road doing great things with companies implementing Lean. I hope to be back on schedule with the blog posts this month and hereafter. A system (or a way of thinking) which intends to create an organization capable of sustained high performace by its leadership and team members to produce continual and repeatable results. A company can achieve this by setting Mid-to-Long Term Management Plans (Annual Plans) that prioritize daily activitites and resources by department or group. The goal is to involve ALL members from the top down who will clarify these targets and value added activity from their own departments/positions. 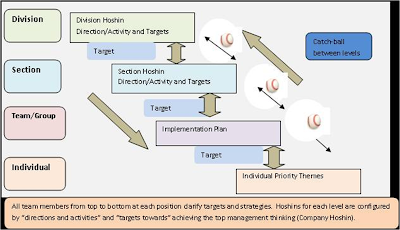 The Hoshin targets can be achieved by continuously turning over the PDCA (Plan-Do-Check-Act) Management Cycle at the MACRO and MICRO levels; checks are performed and follow-ups made during these implementation cycle of the Hoshin. This allows the entire company/organization to have a "line of sight" or work in "one direction" with members at all levels taking initiative solving problems. Some refer to this term as "Catchball". Catchball is a term that describes value added ideas being "thrown back and forth" from management to the team members and team members to the management level which help reach the Hoshin targets. It's important to remember that a company should first define their values, mission, or goals they want to achieve (which should take into consideration - their customer) in order to understand the strategies involved in developing the Annual Plan. The Hoshin will then be broken down into Divisions, Sections, and Individual Teams. These areas will then determine the value-added activities it takes to successfully meet the goals. See the visual below of the Hoshin breakdown process between the different levels within a company. Another key point to remember is that "Problem solving" and "Standardization" are a key components to a Company's ability to see deviation from existing Standards and "thinking" through those discrepancies using the PDCA management cycle in order to get to root cause. The Japanese call this "Kanri Cycle Turnover". Again the micro PDCA activities that solve value added problems towards the company Hoshin goals. Tracey, Great Narration. Appreciate your insight into a powerful yet simple approach to business success.